Top: Stoner Creek Farm Cemetery. 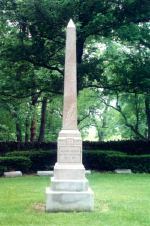 Second Row: Monument to the pacing stallion Meadow Skipper. Bottom Row: Nevele Pride (left) Count Fleet (middle) and Reigh Count (right). STONER CREEK FARM was established by John D. Hertz. 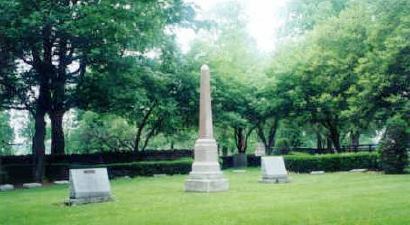 REIGH COUNT was moved from Claiborne Farm to Stoner Creek when pensioned, and was buried here. COUNT FLEET retired to stud here in 1944. 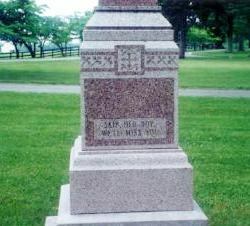 His sire REIGH COUNT and dam, QUICKLY are buried here and he joined them in 1973. The Hertzs sold the farm to the Woolworth family, which bred standardbreds (COUNT FLEET stayed here as a pensioner). One of the leading standardbred sires was MEADOW SKIPPER, a great pacer. NEVELE PRIDE was one of the great modern trotters and trotting sires. -- A.P.